I know Quesadillas are technically Mexican, but the whole idea is simply cheese and some other ingredients trapped inside a tortilla to create melted awesomeness. 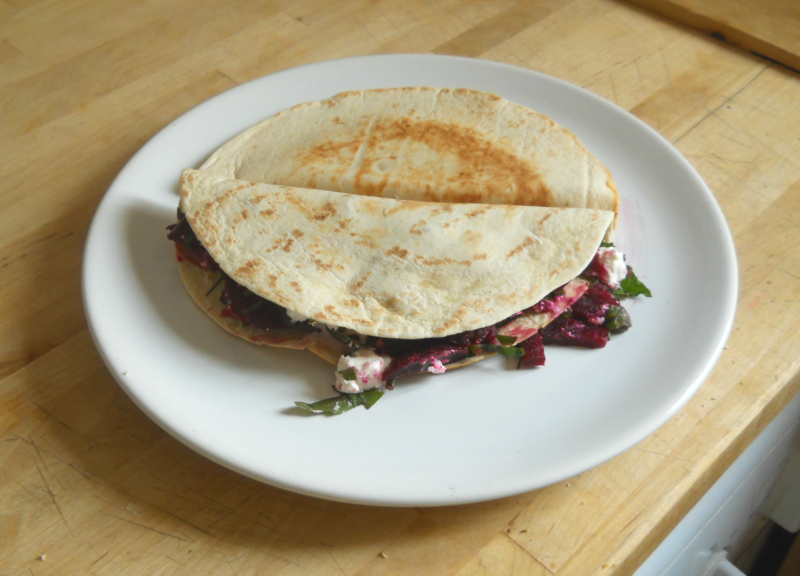 I took this idea really liberally and made quesadillas with goat’s cheese, feta, beetroot and chopped herbs. Yes I am probably as far as I could be from real quesadillas, but it was really good and sometimes you just have to use what’s left in the fridge. Chopped herbs (I had chives, parsley and wild rocket). Tortillas (fresh corn ones if you can, it tastes nothing like the Old El Paso/Sainsbury’s/Discovery flour tortillas – sadly I only had that kind this time). Start by heating up a non-stick frying pan. Throw a tortilla in there (no oil or butter!) and leave it until golden. Turn it around and start adding the cheeses. On top of the cheese add the beetroot and the chopped herbs. Fold the tortilla in two and make sure it is gold on both sides. To serve, I like to cut the quesadillas in triangles and dip them in some kind of salsa/sour cream. 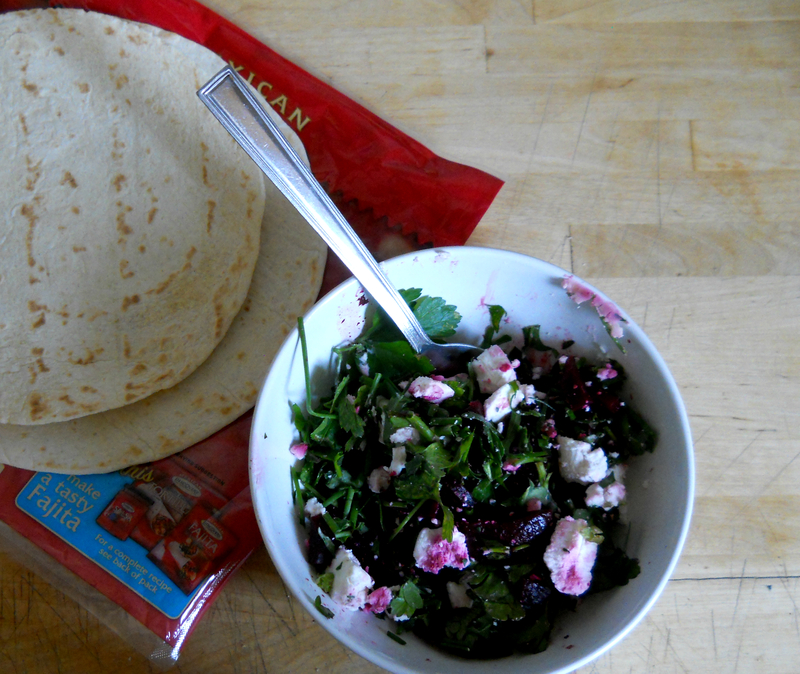 Voila, easy, healthy lunch in 10 minutes or less (I am competing with Mr Oliver here!). 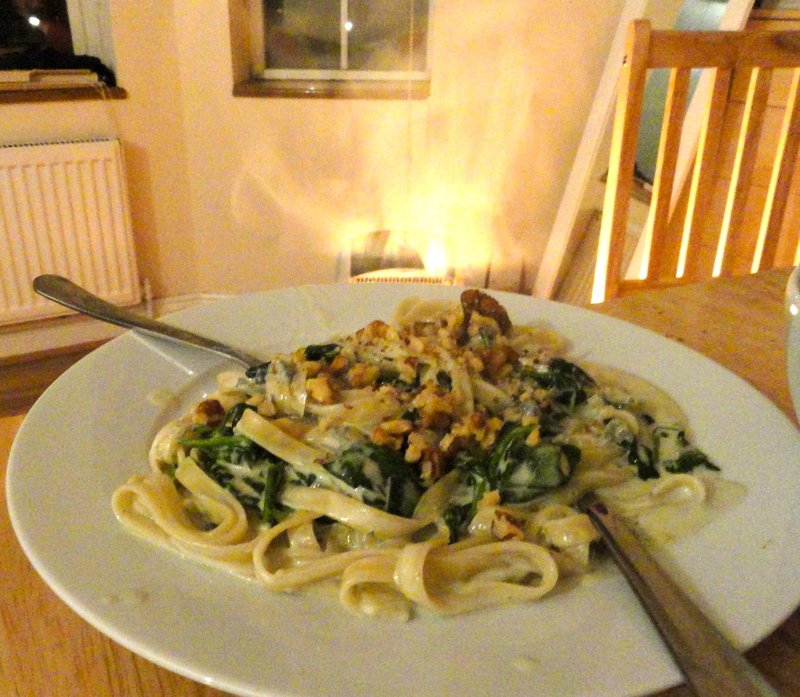 Blue cheese pasta is a slightly fancier student meal, but for its rich taste and fancy feel it does not cost a fortune to make (this recipe gives you food for 3 people, at £2 each. Although if you’re starving it’s perhaps more suitable for just two). A recommendation is to pick up St Agur when it’s on offer, because it lasts for ages in the fridge. This dish is super-easy to make and you simply cannot fail making it if you follow these instructions. 1 pack St. Agur blue cheese. Experimenting with other, cheaper blue cheeses is probably a good idea, however I’ve tried making this with english stilton and that was way too bitter. Put water in your kettle and prepare for boiling the pasta (the sauce takes no time to make). Get your guest to start breaking up the walnut kernels if you bought whole ones. Slice the leek and fry it in a knob of butter until it is soft. Add in some spinach (squeeze it if you’re adding frozen one, you don’t want all that water) and make that soft too on medium heat. Turn the heat down and add your creme fraiche until you have a sauce, and then add the roughly chopped cheese and make it melt into the pan. It is important it doesn’t boil, however it needs to melt enough to be smooth and creamy. Add salt to the sauce (remember it should taste a little bit too much when you taste it in the pan, for the pasta spreads it more thinly once it is served). If you fancy artichoke hearts, this is the time to add them into the sauce. 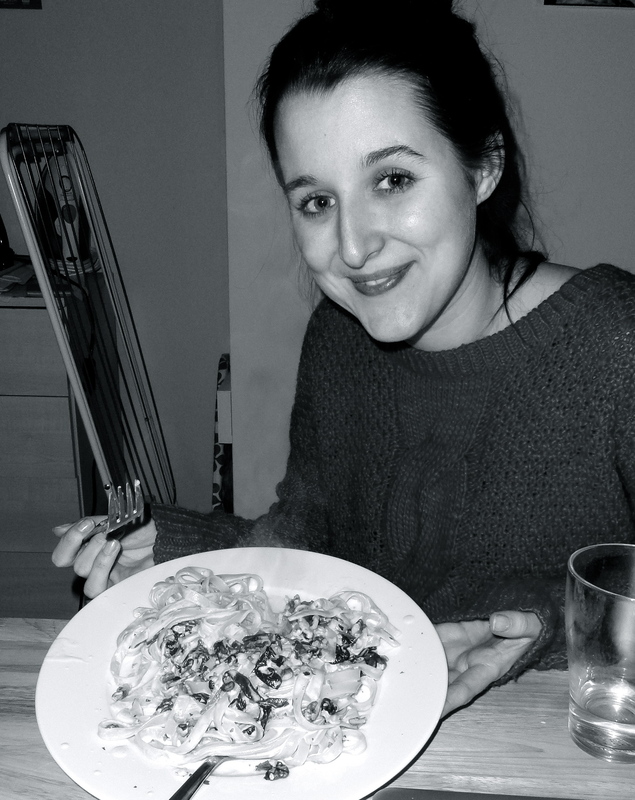 Drain the spaghetti when it is done and mix it all together (serving spaghetti and sauce separately is a pet-hate of mine). Serve onto plates immediately and scatter the walnuts kernels on top. Eat!